Website and processes: 29 Sep 16 Jane, 5/5 Excellent "Easy to use"
Enter the flight deck of a Boeing 737-800W aircraft simulator where you'll be all set, engines running on the runway, ready to put you and the aircraft through its paces. 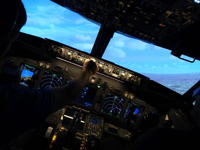 We'll climb up to 10,000 feet, which is over 2 miles high, and show you how to fly a 75 tonne airliner! Once you've mastered the controls, you'll be vectored in for an approach and landing. Have you got what it takes? This experience starts with a free safety and profile briefing, which does not come out of your simulator time. Complimentary Tea and Coffee are available during your visit. You must also bring photographic ID before being allowed on the flight deck, a photocopy will be taken. This is for security reasons.